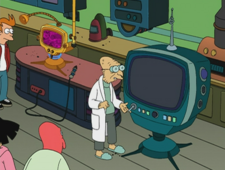 The Who-Ask Machine is an invention by Professor Farnsworth which is used to decide who should ask the next question on the What-If Machine, meaning that if it only has a single purpose it is basically a high-tech random number generator. The machine finds it hard to decide who should ask the question. Who-Ask Machine: Um, uh, um... Amy. Who-Ask Machine: I mean, Leela. This page was last edited on 1 September 2013, at 04:50.